He was, for many years, the elected Republican Committeeman of Schaumburg Township in Cook County, Illinois, who built a highly efficient and very effective community-based political organization that, in its ability to marshal the troops, adapt ever-changing technology, teach conservative principles, train street-level campaigners, and win elections. He called his organization “ROOST”: The Republican Organization of Schaumburg Township. It was a model of modern suburban and urban community organizing. He would do simple things; for example, he would keep track of public records such as the issuance by local towns and villages of occupancy permits for new housing as cornfields were turning into bedroom suburbs; when new homeowners would move in, he would send them a welcome letter and dispatch the neighborhood precinct captain to the house to introduce herself and present a welcome basket — along with a warm, friendly, and immediate connection to the local Republican Party. ROOST maintained a full-time office staff that enabled Don to function as Schaumburg’s ever-vigilant and omnicompetent ombudsman, always ready to help a neighbor with a problem with government or other community institutions. He was a strong believer in America and in welcoming newcomers to this country, helping to inculcate them in the principles of the American Declaration of Independence and the United States Constitution. He took great pleasure in helping people navigate the shoals of the immigration and citizenship process, often accompanying them to naturalization ceremonies and making sure that, if possible, the same day they received their Certificates of Naturalization they registered to vote — and they received their membership cards in the Schaumburg Township branch of the Republican Party. He also served, by turns, as an Illinois State Senator; the Chairman of the Cook County Republican Party; a member of the board of directors of the Illinois Conservative Union; the founder and first Chairman of the American Legislative Exchange Council; a member of the board of the Regional Transportation Authority (serving northeastern Illinois); a U.S. – Canada International Boundary Commissioner (proudly noting that on his watch America’s northern border was never invaded once); the Illinois and Midwest director of Ronald Reagan’s insurgent Presidential campaign of 1976 and his victorious Presidential campaign of 1980; and, in a rare defeat, the man who lost the 1982 Republican Primary for Illinois Lieutenant Governor to George Ryan (think of what might have been gained for Illinois, and what ignominy the Republican Party might have been spared, had Don won that election). I note, as a point of personal privilege, that Don was the manager of my campaign for President of the Cook County Board in 1994. I often recall with pride that in that election, although I lost, I received half a million votes — this in Cook County, then no less than now, a Democratic Party stronghold. In fact, in that campaign I received more votes than Lori Lightfoot received in winning her race for Mayor of Chicago in a low-turnout election this week. (To be sure, I ran countywide, in the suburbs as well as in Chicago, but if I didn’t get more than her 365,000 votes in Chicago I came close.) Don Totten was a big part of that. In Schaumburg, Chicago, Illinois, and across America, we have lost a friend, a neighbor, and a captain of Edmund Burke’s “little platoons”. He was street-smart and idea-rich, a man with an incisive mind and a gentle sense of humor. He was an American patriot who did all that he did in service to the American people, firmly believing that America is the world’s best hope. 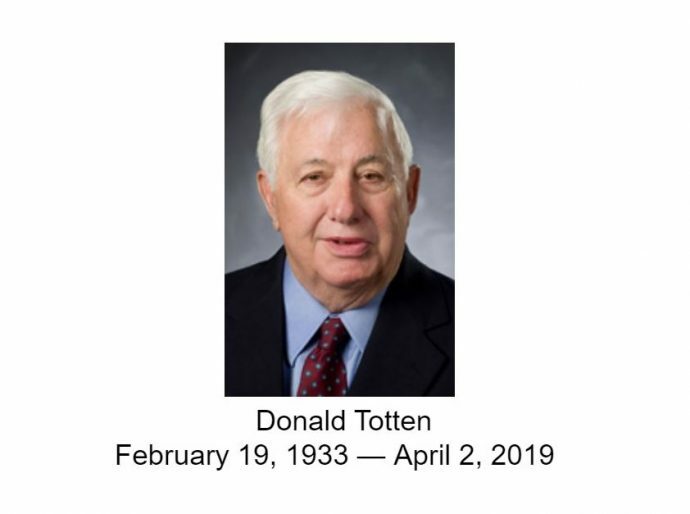 He once said to me that “To be born an American is to be dealt three aces on your very first day.” And if Don Totten was your friend, you had that fourth ace.